HEAVY ITEM. NO CASH & CARRY. WE DELIVER WITH OUR TRUCKS. Blower included and requires16 amp electric supply. The 5-in-1 combo style moonwalk offers a large interior jumping area with a basketball hoop, both log and pop-up obstacles, climb feature and a convenient exit slide for hours of active fun. This unit has mesh sides and a partially covered top for shade. 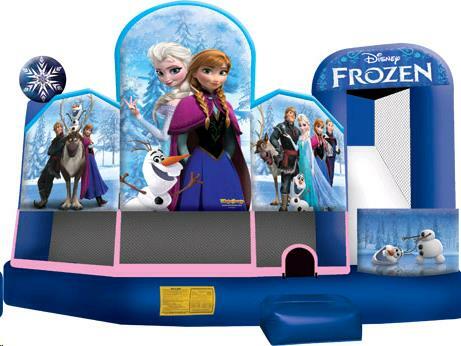 * Please call us for any questions on our moonwalk frozen w/slide 20x19x15 foot tall rentals in Ft. Wayne IN, Warsaw, Syracuse, Auburn, South Bend, Indianapolis IN.